This is really a long story so I am not responsible for any time wasted for reading this text. But tell you, this is an interesting story to share! Have fun reading it. In the end of this entry, there is one quiz. The first person answering the questions correctly will get special prize from me. The plan was simple – we wanted to use the free-from-toll alternative way from Kuantan to KL but in the middle of the way to drop by at Berkelah and then go straight away to KL. That’s basically it. It was our first time, my first time to be more particular, driving through the road. But, as it is already written in His Book, it didn’t happen. The driver you-know-who forgot to fill up the petrol causing them to look for the nearest gas station before moving up to the park as we’ve told it took further travel to the jungle before we can actually reach it. But, as we moved further and further, there was none although it was already about 10km away from Berkelah. 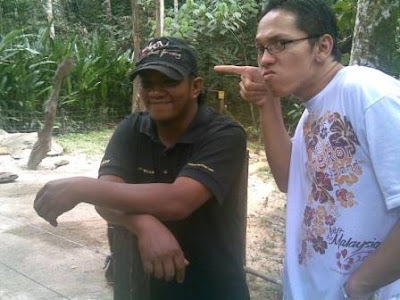 Then we decided to cancel the trip to Berkelah and just drive to KL and that’s it. But wait.. That was not it! For your information, a good and informative recreational park must show the way to the main attraction of it, but this does not happen in Air Terjun Teladas. I’m quite sure (although it’s the fact that I’ve already disappointed with it) there’s at least one waterfall but may be it needs extra energy and knowledge before you can find the waterfall. But can’t anyone put some effort to inform the visitors to where they should go to find the waterfall? Put signboards or direction la! Next we moved not-so-straight away to KL. But wait. 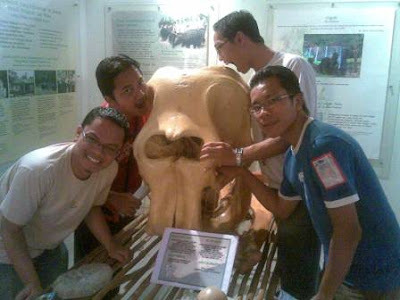 We saw another interesting signboard – Pusat Pemuliharaan Gajah! 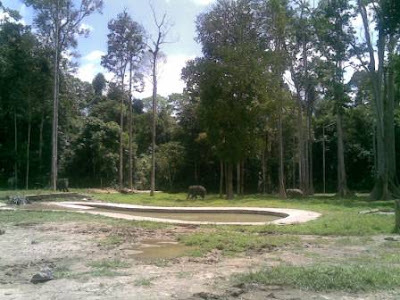 This is a chance to see the elephants! We haven’t seen elephants for quite some time. Was it when we were in childhood? Duh… Can’t recall. Entering the center does not cost you anything but they do wish for sincere donation if you are generous and care enough for the wild life. If you wish to play around with the elephants; feeding them, riding and walking and of course getting wet in the river with them, you need to make prior reservation especially in holidays. In our case, as we didn’t plan earlier to go there, so we just got the chance to watch a video on how they transport the elephants from the jungle to the reservation center and keep them there. We could only see the real elephants from afar and one not-so-little but cute little baby elephant in the corral. Identify how many elephants are there! 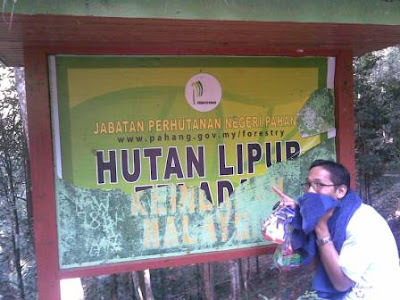 Wait, we thought we saw a signboard about Deerland next to the Pusat Pemuliharaan Gajah one. Why shouldn’t we go there also! There, we got the chance to play (the day was all about playing with animals I suppose) with deer, rabbits, bears and few other tame animals. We really had fun like we have never met such playful-able animals and of course we being typical us, taking pictures is never out of our dictionary! 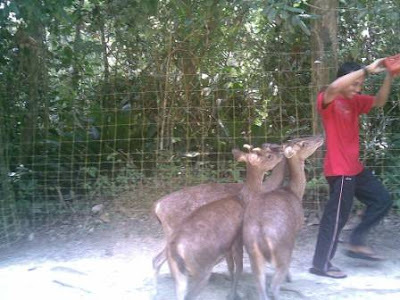 I recommend you to take the chance to go there and see and play with the animals. The RM5 cost did worth it I tell you! That's the closest i could get. See the finger nails? 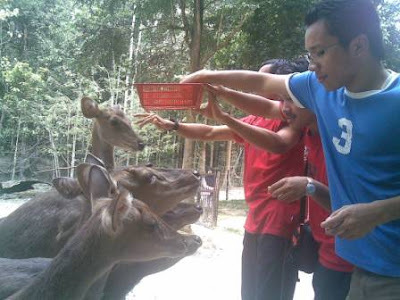 Feeding the deer was fun! Try it and only then you'll know what fun means here! Don't worry. This one is not poisonous and small of course. Then it was already 3pm but we were still in Pahang. Haha... Ok guys, time to drive to KL! Enough is enough! We got family to show our faces off! Pojan! This guy kirim-ed salam to you! With Bro. Black. Ha? Bukit Fraser? *you know what everyone thought right? Yey! Driving to Bukit Fraser took us quite long journey before we could find the next signboard to turn to the real place. We thought we’ve lost already. Once there, there were so many people waiting to go up to the hill. 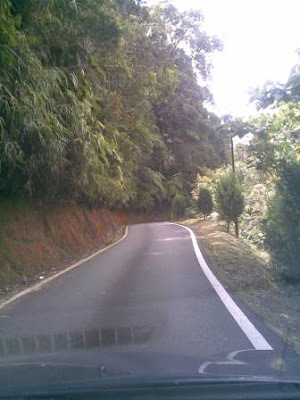 For your information, Bukit Fraser has a specific and unique schedule for vehicles to move up and down the hill because the road is small. Basically odd o’clock are to go up to the hill while even o’clock are for going down. You see how small the road is? In our case, we had to wait for 40 minutes for the time to reach 5pm. This is the not-all-time-you-can-get chance to see Bukit Fraser so waiting for that long wasn’t really a matter for us. 5pm! Time to go up to the hill! Yey! The next day, after having a breakfast for two-and-half-hour (don’t worry, we paid for the rest 3 people’s fee for the breakfast – refer to the quiz), we went to Air Terjun Jeriau, located around 5-10km from the main city of Bukit Fraser. At last we found the real waterfall after getting duped with Air Terjun Teladas the day before. 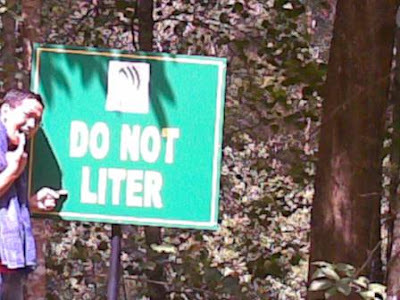 Nothing much there except the wrongly-spelled “Do Not Liter” signboard. Zubir, Safwan, Asmawi, Farid and Zaki look for a place to sleep in Bukit Fraser and they found an inn. The fee for the inn is RM130 for a night stay including breakfast for two. But it requires another RM20 for the deposit which will be returned upon checking out. Zubir, Safwan and Asmawi give out RM50 each for the payment. The next day, for the breakfast, they don’t want to be bias about who will be going for the breakfast so they decide that all will go for it although extra fees will be charged. The fee is RM20.70 for each of the three. Farid pays RM30, and each RM10 from Zubir, Safwan and Asmawi. Safwan adds some more RM2 while Zaki can only afford to add 10 cents to make the payment even. In the end they make the calculation and everyone is satisfied with how their money goes because it is an even distribution. Upon checking out, Zubir takes his RM20 deposit. 1. How much each of them spends for the stay and breakfast? 2. Who spend(s) more and who spend(s) less? 3. How much the spender(s) have spent and how much the rest need(s) to pay? Kuala Gandah tu best kan. Tak naik gajah ke? Lg best tau! Erm, beruang tu cam dh besar je dr dulu. 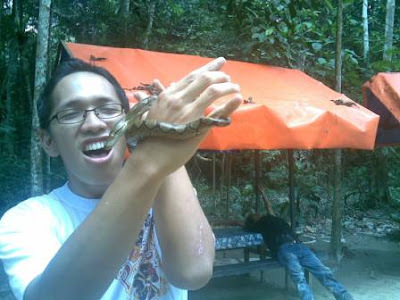 Tp dia tak gigit pun. Dulu siap bg dia jilat susu pekat dr tangan smbl usap2 kpl dia. Haha! woi.. ular kau pegang tuh?? aku dah fenin lah petang nih..
ni yg buat aku jeles nak mampos nih!! ko tau tak betapa BOSANNYE hidup aku sjk-2menjak nih??! and here you put all the pics about every places you went!! arghhhh!! knape black kim salam kat pojan je??!!! Mana aku di hatinya??! ampeh black. huhu. Oh, deerland mmg best. Kalo masuk lagi ke arah Institut Kepelbagaian Biologi, ada sungai yg best, bleh mandi dan bleh terjun dari tepi jalan, tinggi gak. Syok! BEst2! pegang ular? takde hal la.. aku tak geli pun..
you dont need to feel bad. let's chill out and have fun here in pahang. jangan dok terperap kat KL sepanjang mase. get refreshed in pahang. jom! 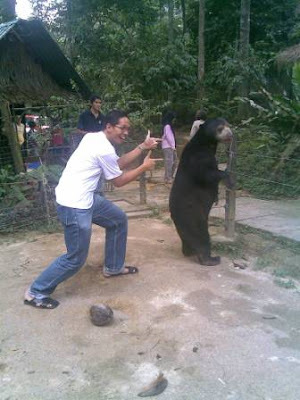 main ular tu.. boleh la ye cuba2 nasib kat mana2 zoo plak..